The masters return, bringing Hawaii's unique folk styles and the delightful experience of kī-hō'alu (slack key guitar) to the mainland. 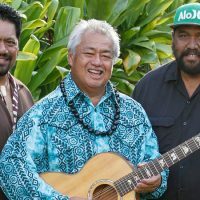 Four-time Grammy-winner and master slack key guitarist George Kahumoku Jr. will be joined by multi-instrumentalist Nathan Aweau (a member of such award-winning groups as HAPA and Ka'eo) and slack key guitarist David "Kawika" Kahiapo (winner of two 2015 Na Hoku Awards). Together, they will weave the distinctly Hawaiian style of open tunings, ukulele, and Hawaiian vocals into a performance that will carry you back to the Islands.